Homeland Security Secretary Kirstjen Nielsen, Pres. Trump, and Customs and Border Protection Commissioner Kevin McAleenan at a Feb. 2018 event to promote Trump's border security proposals. The government shutdown has caused Customs and Border Protection (CBP) to furlough employees “critical” to the agency, according to an internal CBP document obtained by TYT. The email also tells agents stationed outside the U.S. they are ineligible for state assistance unless they return. The document, an internal email, was provided to TYT by a CBP employee who requested anonymity for fear of reprisal. President Trump has argued that the government shutdown is justified due to the national security threat he claims undocumented migrants pose. The shutdown is now in its 34th day, the longest in U.S. history. 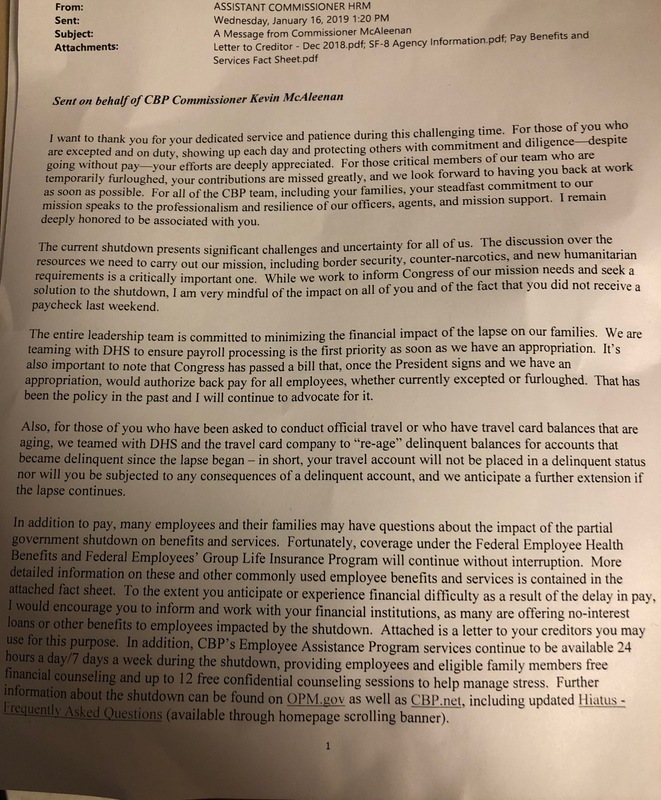 The email, sent to employees on behalf of CBP Commissioner Kevin McAleenan, also advised employees who “experience financial difficulty” to “work with your financial institutions, as many are offering no-interest loans” to employees affected by the shutdown. The email also reminds employees of the “up to 12 free confidential counseling sessions to help manage stress” provided by CBP’s Employee Assistance Program. An internal CBP email addresses resources available to furloughed employees. Attached to the email is a document containing information on how to apply for state unemployment benefits. CBP has locations all over Puerto Rico,. The agency sent employees to the country to assist with the recovery effort following the devastation of Hurricane Maria. A Transportation Security Administration (TSA) employee also provided TYT with internal documents to illustrate the ubiquity of discussion about financial assistance among federal workers. The employee, who requested anonymity in order to avoid reprisal, showed TYT a list of half a dozen emails they received on January 22 alone, pertaining to various forms of financial assistance. 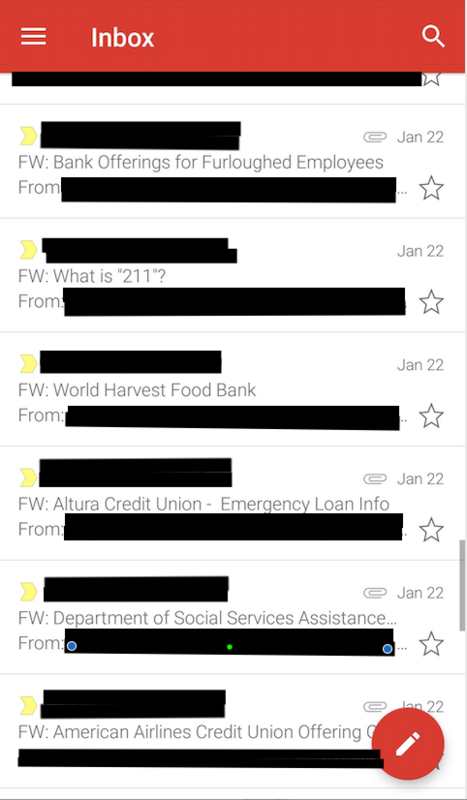 Screengrab of inbox of TSA employee displaying agency emails regarding financial assistance. One of the emails contained an offer for a loan of up to $1,200 at 1% annual interest for air transportation workers.